A PET cat could lose its paw after it got caught in an illegal gin trap. Gillian and Stephen Biggs, of Barden Lane, Burnley, were horrified when three-year-old ginger tom Driscoll came home with the device clamped to his leg. They rushed him to a vets and are now facing an agonising wait to find out whether his injured paw can be saved. Stephen, 54, a HGV driver, said he heard Driscoll struggling to get through the cat flap at home. He then called his wife, Gillian, 47, who was out walking their dogs, and the pair immediately took him to the vets. Gillian, who is a children’s worker, said: “He’s lost the feeling in his paw and I don’t think he’s going to get that back. “We’re just lucky he managed to find his way home. He could have been spooked. “Most cats would panic and go to ground. Gillian and Stephen said Driscoll often spends time in nearby allotments in Windermere Avenue, and they suspect the trap may have been set there. The couple are now appealing to those responsible for setting traps to stop using them as it could hurt a child. Gillian said: “My only concern if they are using them down there is the kids and any other animals that go down there. “I’m not saying don’t use traps, but use humane traps. They’re trying to keep vermin down, but they shouldn’t use these. The couple have reported the incident to the police. 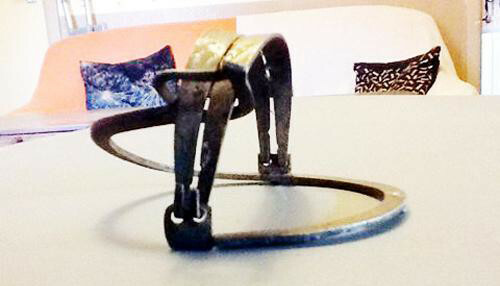 The use of this type of spring trap with toothed jaws, known as a gin trap, was banned in 1958, according to the RSPCA. Chairman of Reedley Hallows Allotment Association, Alan Yates, denied that the trap had been set on one of the 69 plots. He said: “It’s nobody down here. We’re really sorry it’s happened but it could have been in the woods, or anywhere. “We have cats of our own for ratting and we just don’t allow it. If that had happened down here the cat would never have got home. “If it was from here we would know. The cats down here would be the first to go into the trap. “We have cats down here that have left their homes and are happy down here. “Everyone down here is really environmentally aware. We don’t even use slug pellets. “We rescued a hedgehog from down a drain the other day. It took us two and a half hours to get him out. Reedley Hallows Allotment Association secretary Peter Watts added: “That’s not a rat trap. It’s more for foxes and badgers and if you wanted to catch something like that you’d have to stake it out on a chain, so the animal wouldn’t be able to go off with it. Nobody from the RSPCA was available to comment yesterday.